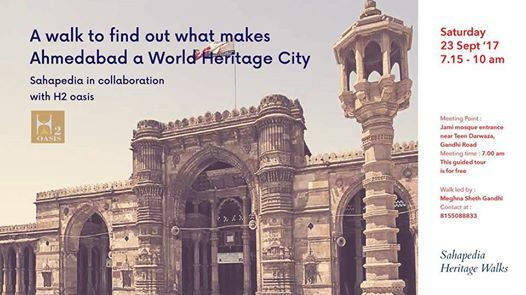 Come, embark on a stroll that reveals what makes Ahmedabad deserve the prestigious UNESCO World Heritage City status to join the ranks of cities like Paris, Vienna, Cairo, Brussels, Rome, and Edinburgh. Is it the magnificence of the Islamic monuments or the exquisite Jain derasars perched at every nook and corner of the city? Or, is it the pol architecture of Old Ahmedabad, containing these and other temples of various faiths—the Swaminarayan, the Vaishnavas, the Mahadev temples—that impressed the UNESCO jury? Come and know why we, Amdavadis, should value our indigenous heritage (our ‘vaarso’) better and beyond its tangible aspects. We walk the talk on this. Starting with understanding the unique Indo-Saracenic style of architecture, clubbed with a walk in the maze of narrow streets to explore the very thoughtful, vernacular architecture of the pols of Ahmedabad. Walk led by Meghna Sheth Gandhi, founder of H2 oasis, ‘the History & Heritage Oasis’. ● Mandatory registration closes after 25 entries. • This guided tour is free. • Ample parking space is available near the Jami mosque. • Children above nine years of age are also welcome accompanied by an adult. • Photography is allowed at most places. • Wear comfortable footwear, avoid leather wear, slip-ons are recommended.